Metaversability: Serious Fun: &#8220;Fronterra OLIVE ist die virtuelle Welt für Corporate Anwendungen&#8221; - Stefan Weiß, FUTURELAB (German). 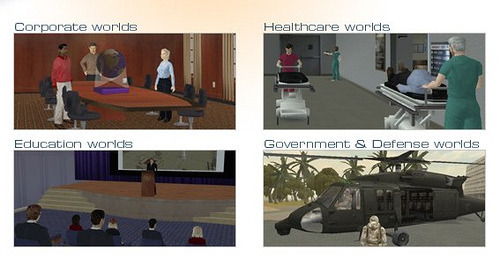 Yes, their platform has some significant features for corporations and professional set-ups that Second Life lacks. But it&#8217;s still only available for Windows. I can&#8217;t run a conference or presentation (for which OLIVE is really well suited) professionally while excluding whole departments or even a small group of attendees. It just doesn&#8217;t work without cross-platform compatibility guys! Serious Fun: &#8220;Fronterra OLIVE ist die virtuelle Welt für Corporate Anwendungen&#8221; - Stefan Weiß, FUTURELAB (German). Yes, their platform has some significant features for corporations and professional set-ups that Second Life lacks. But it&#8217;s still only available for Windows. I can&#8217;t run a conference or presentation (for which OLIVE is really well suited) professionally while excluding whole departments or even a small group of attendees. It just doesn&#8217;t work without cross-platform compatibility guys! Serious Fun: “Fronterra OLIVE ist die virtuelle Welt für Corporate Anwendungen” - Stefan Weiß, FUTURELAB (German). Yes, their platform has some significant features for corporations and professional set-ups that Second Life lacks. But it’s still only available for Windows. I can’t run a conference or presentation (for which OLIVE is really well suited) professionally while excluding whole departments or even a small group of attendees. It just doesn’t work without cross-platform compatibility guys!